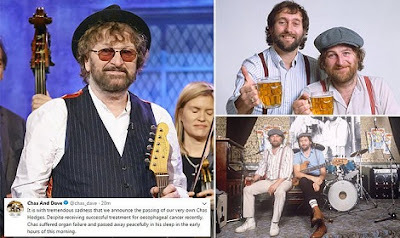 Chas and Dave's singer, Chas Hodges, died, according to a message posted by the official Twitter account of the musical duo. The message, published in the 11 thousand followers of this account this afternoon, said: "It is with tremendous sadness that we announce the death of our own Chas Hodges. "Despite receiving successful treatment for esophageal cancer recently, Chas suffered an organ failure and died peacefully while sleeping in the early hours of the morning."